Your wall of ideas is filled with hundreds of ideas! The time has come to make a selection. What are the really promising ideas? Use the innovation matrix and the ranking system on this page to filter out the best ideas. 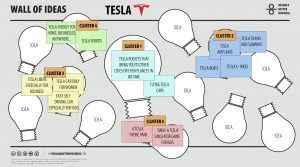 In one of our previous blogs about ‘How to create a thousand ideas in no time’ we created the Wall of Ideas for Tesla. Now that we have generated hundreds of ideas, it’s time to make a selection. What are the really promising ideas? This is where many teams get stuck. What’s needed is a simple way to categorize ideas with respect to the Design Criteria you defined earlier. 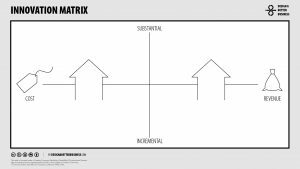 To use the innovation matrix, pull your ideas off the wall or canvas and, as a team, discuss where each idea belongs on the matrix. Unless you’ve modified the canvas to represent your own axes, the discussions you have at this point are not about feasibility or even viability. They’re about the potential for change. 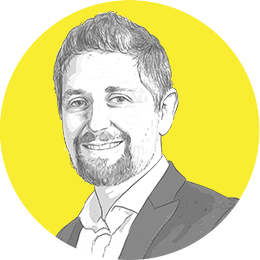 Is it an incremental change, one that your company could take on with little work or resources? That idea should probably placed in the bottom half of the matrix. Is it an idea for generating more revenue? The right half is where that one belongs. This tool is designed to separate the ideas that result in incremental, easy-to-accomplish changes from the ones that will make a big difference. For instance, an idea to reduce costs by mandating that everyone print double-sided pages is incremental and small. Sure, for a large company, this could certainly reduce operational costs. However, it’s probably a change that can and should be implemented anyway. A big change will cause bigger shifts. These ideas will show up in the top quadrants of the matrix. Ask fire starter questions or do an ‘into space’ exercise to push the boundaries and get people think bigger. When the matrix is completely filled up, you might even distribute thes to people who can take them further. But the ones on the top make the biggest changes. Above you can see the Innovation Canvas for Tesla. On the left side on the top you see ‘Tesla robots build everything in factories’, which is a substantial change that will reduce the costs of Tesla. Another one, ‘build distributes network of micro manufacturing plans’ is in between an substantial and incremental change, and this semi-big change will lead to reducing cost. ‘Tesla goes totally paperless for everything’, is not a big change, but it will reduce paper and printing costs. On the right side you see big changes like ‘Tesla Robots’ and ‘Tesla energy for home’. These changes are substantial and will lead to increasing revenues. The riskiest assumption ‘ Tesla rockets that bring you to other cities or even planets in no time’ is more in the middle, because we don’t know if people will use these rockets, so we are not sure if the revenues will increase that much. Small changes such as Tesla boats, bikes, trains, subways, Tesla cars especially for women or business people, are incremental changes but will increase the revenues of Tesla. Once you filled the Wall of Ideas, what are you most promising ideas? 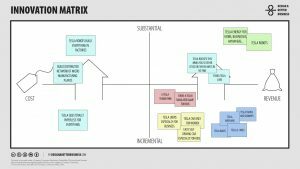 Use the innovation matrix and the ranking system on this page to filter out the best ideas, together with your team. When you find people sticking to small, incremental ideas on the bottom half of the matrix, you’ll need to find ways, such as fire starter questions or an “into space” exercise, to push the boundaries and get people thinking bigger. There could be low-hanging fruit in any one of the quadrants that represent quick wins. When the matrix is completely filled up, you might even distribute these to people who can take them further. But the ones on the top make the biggest changes. Do you like our tools? You can experience ‘Design a Better Business’ live! Feel the uncertainty in your bones when we take you on a design journey. Experience and learn what it means to think and work like a designer. Check our upcoming events in New York City and in Amsterdam.